SG Food on Foot | Singapore Food Blog | Best Singapore Food | Singapore Food Reviews: Element @ Amara Hotel - An Array Of Festive Delicacies Alongside LocalAnd International Favourites. 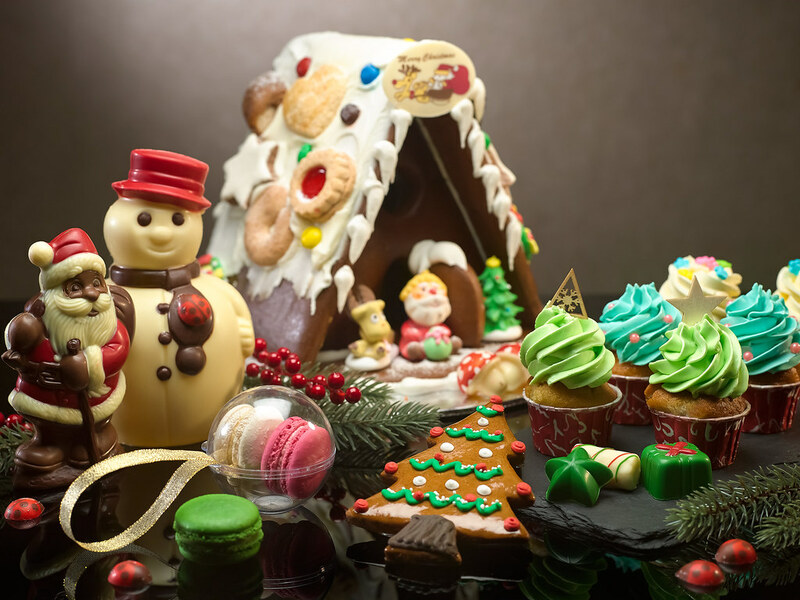 Element @ Amara Hotel - An Array Of Festive Delicacies Alongside LocalAnd International Favourites. 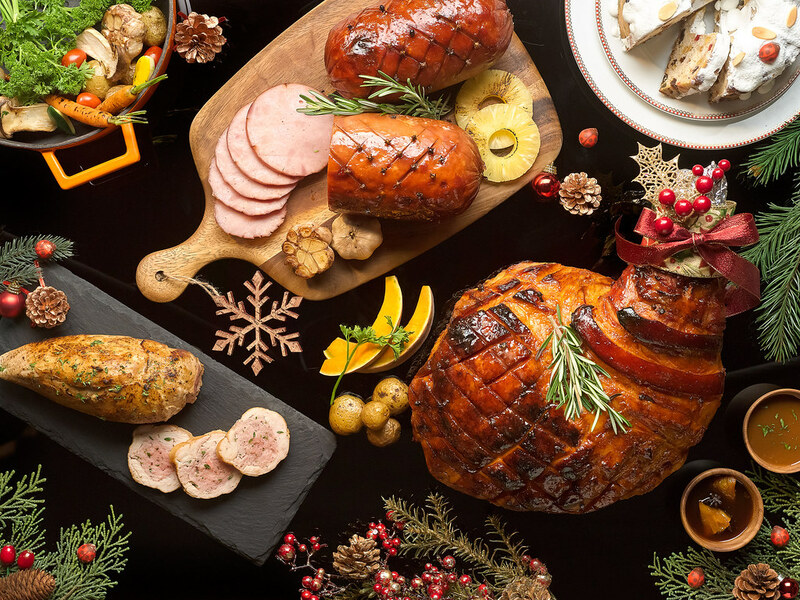 Coming to the end of the year, Element at Amara Hotel marks this festive season with a premium celebratory spread. 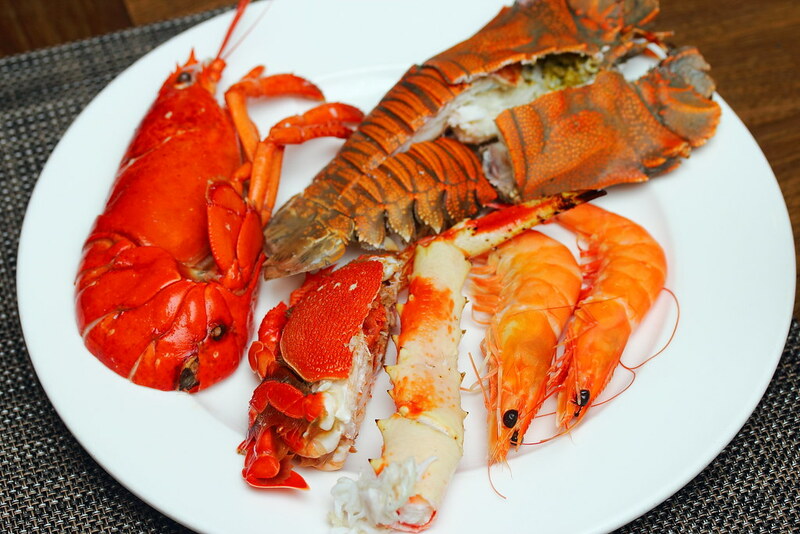 Among the usual buffet spread, you will expect an enhanced seafood spread alongside your mouth-watering grilled and barbecued delights. The seafood station will drawn you in with its arrangement of Alaskan king crab legs, scallops, crayfish and Fine de Claire oysters. A dash of tabasco and lemon juice shall wake up your taste buds for the rest of the spread. What caught my eyes when I first stepped into the restaurant was the rows of sushi, in which amongst them was my favourite Salmon Aburi! Each piece was lined with a good amount of fats that melted in my mouth within seconds. The charred mentaiko sauce together with the fatty sweetness proves to be most popular as well, as they were snapped out most of the time. 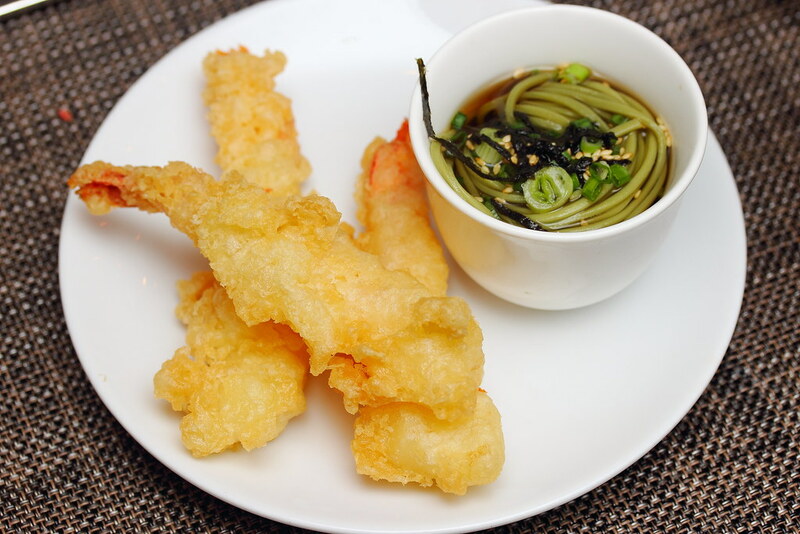 The Ebi Tempura is a must-have. The golden batter was light and airy, and the prawn within was still firm and bouncy. I made my own mini soba meal with tempura! Another signature dish here is the salmon confit to be enjoyed with tangy tomato salsa to compliment its strong flavour. Another premium seafood addition is the Cod Fish with Bonito Flakes at the hot station. 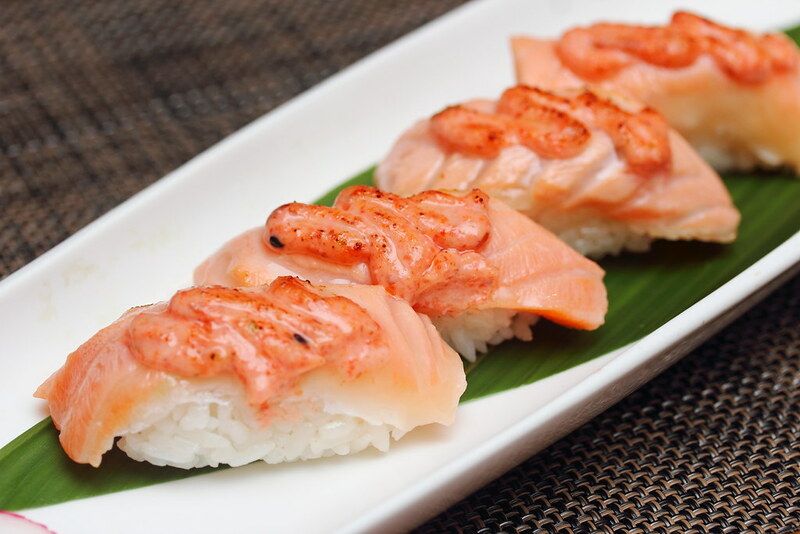 That, together with salmon aburi, really excite my appetite. Each slice was succulent and meaty, with the savoury bonito flakes teasing out its delicate sweetness. 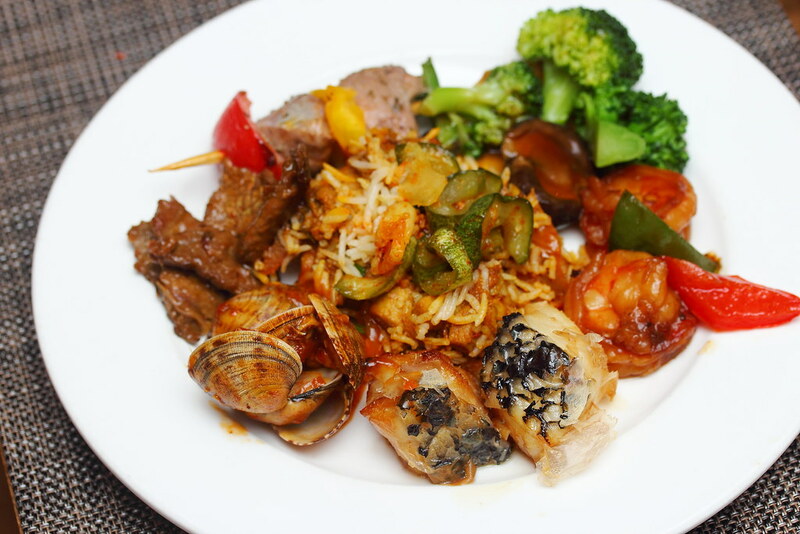 Alongside, there are Stir-fried Beef Fillet with Chilli Bean Sauce and Wok-fried Clams with Sambal Belachan to fire up your senses. 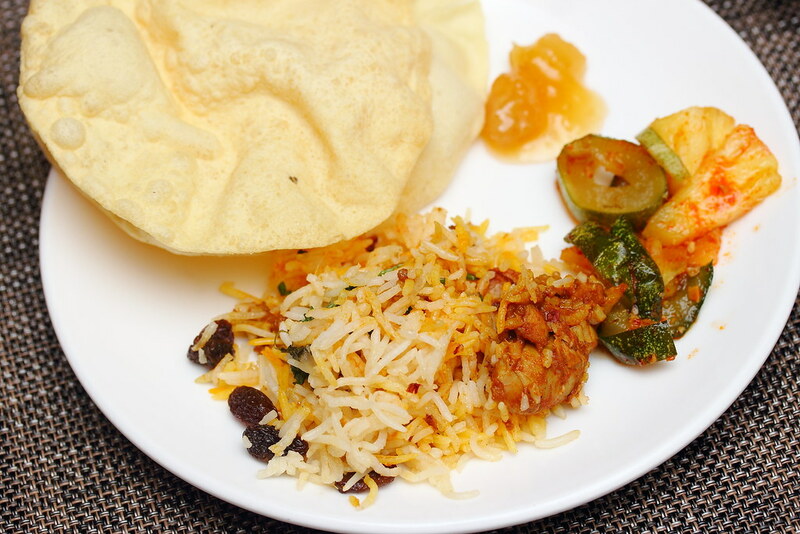 Multi-cultural flavours is also what characterised this festive spread. 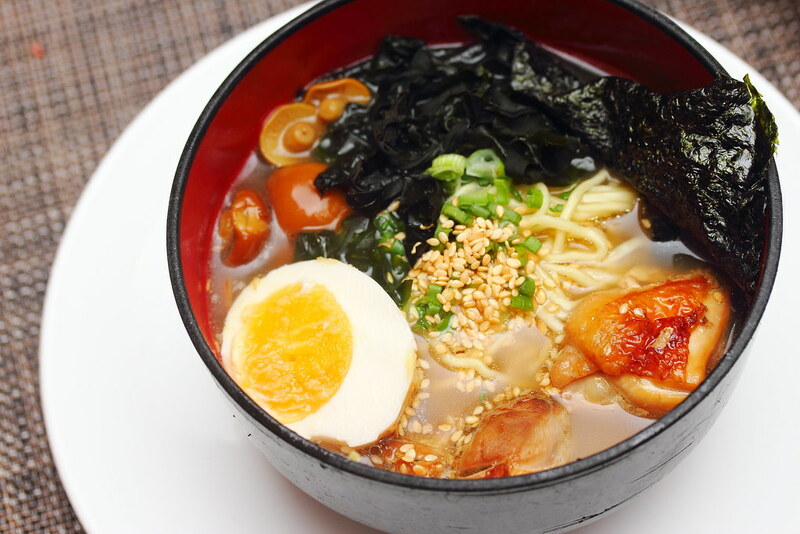 Ramen lovers must give their Chicken Ramen a try. The broth was pretty hearty, and noodles springy and al dente. The best part is that I could D.I.Y with mushrooms and wakame! For a even heavier taste, you can go for their Mutton Skewers, as well as the Chicken Bryani with Papaddum. 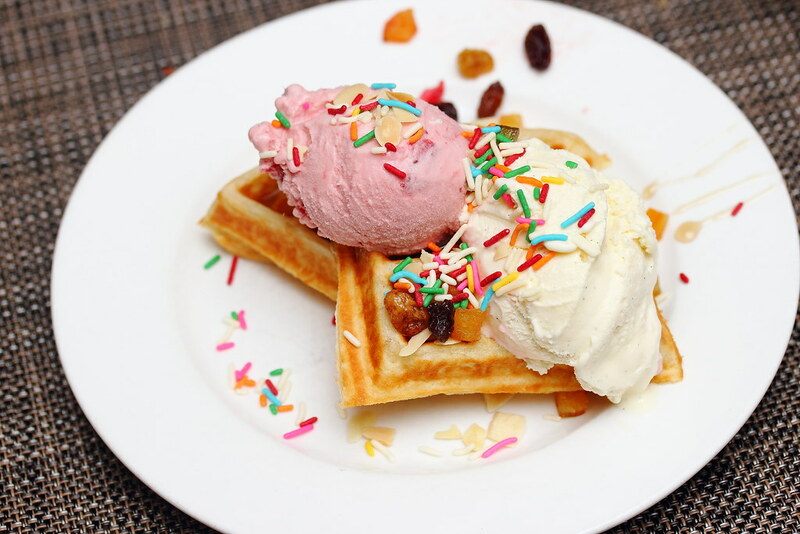 To round up the evening, indulge yourself in their homemade Ice Creams and Waffle. My favourite is the strawberry ice cream which bursted with tanginess whenever I bit into its frozen strawberry chunks. 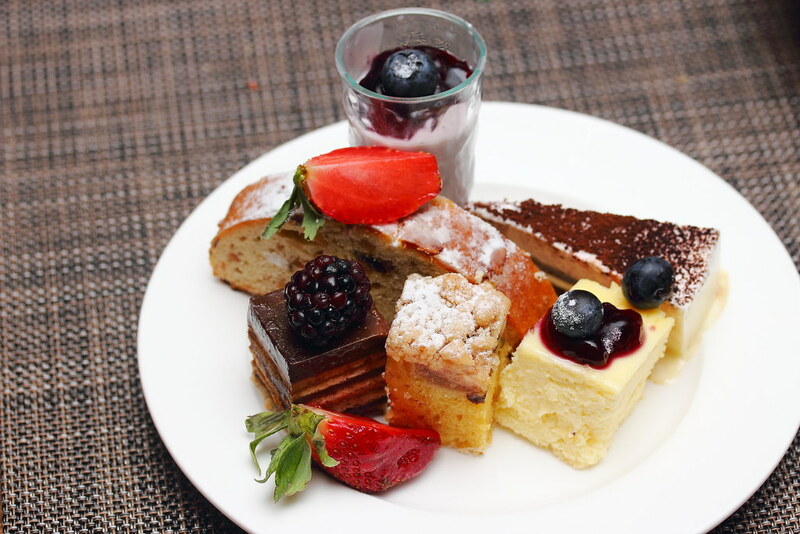 Create your own high-tea session with their range of petite cakes. I like the Tiramisu's well-soaked sponge and light cheese filling. I also enjoyed the Blueberry Cheesecake for its fluffy texture and lemony taste. 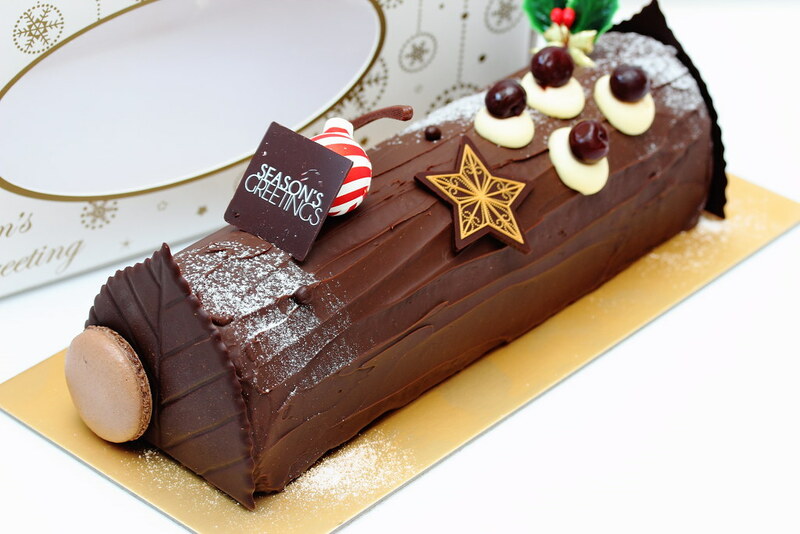 Closer to the Christmas week, favourites such as live carvings of Roast Turkey, Turkey Roulade with Truffle Mushroom Stuffing, Duck Rillettes marinated with red wine, duo of Liver Pate with Foie Gras amid sweet treats like assorted Log Cakes and Christmas Cookies will be offered to provide the full experience of festive celebration.